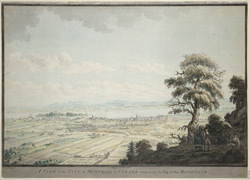 Distant view of the city of Montreal in Canada. The city is situated on the a strip of land known as the Island of Montreal at the confluence of the Saint Lawrence and Ottawa rivers. The island divides the Saint Lawrence river in two. A small village was discovered here in 1535 by Jacques Cartier however the settlement was not further developed until the mid 17th century when it became a French missionary colony and was known as Villa Marie. Montreal remained French until the mid 18th century, when it was surrendered it to the British army. Because of its strategic position on the St Lawrence River with the ease of access across Canada, Montreal became an important fur trading centre.